The flowers, originally described as pale yellowish or almost white by Werdermann, may by white, yellowish-green pinkish or purplish. Has creamy-white to purplish flowers in spring. 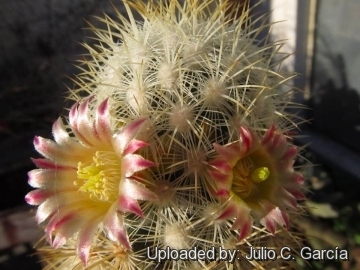 Origin and Habitat: Mammillaria microhelia is only found in the central part of the state of Queretaro, Mexico (Extent of occurrence less than 1,000 km² ). Altitude range: It grows at elevations of 2,000 to 2,600 metres above sea level. Habitat and Ecology: This cactus grows amongst volcanic rock in semi-desert (matorral) and submontane deciduous oak forest with Quercus depressipes, Quercus eduardi, Quercus grisea and Quercus potosina. 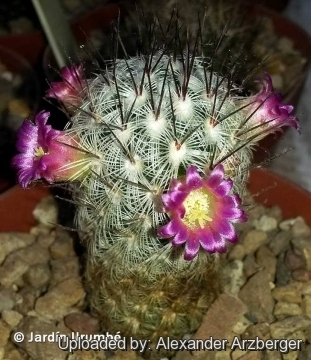 Mammillaria microhelia is considered to be Endangered due to its limited range, its occurrence in less than five locations, and an ongoing decline due to habitat degradation (grazing) and possibly decline of mature individuals caused by illegal overcollecting. The estimated population size of this species is estimated to be less than 500 mature individuals. 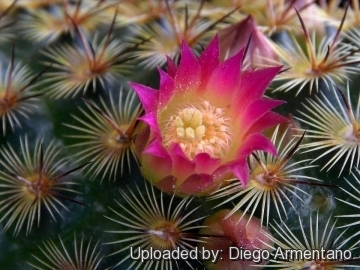 Mammillaria droegeana 2 Hildm. ex Repp. 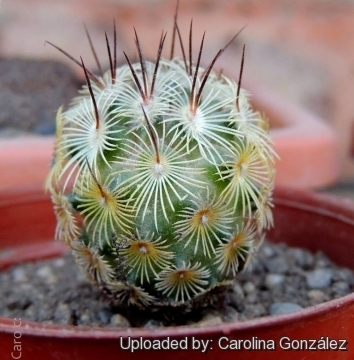 Description: Mammillaria microhelia is a particularly attractive small columnar, perennial cactus both solitary or forming clumps and bearing cream or brown spines, discolouring with age. Has creamy-white to purplish flowers in spring. 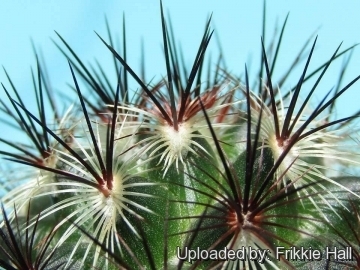 Spines are arranged like the rays of the sun. Stems: Cylindrical, medium green, to 15(-25) cm or more high, 3-5(-6) cm in diameter. Tubercles: Blunt conical, rounded apically, keeled, without latex, axils naked or slightly woolly, later naked. Central spines: 1-4, sometimes absent, occasionally as many as 8(-11), stout, needle-like, straight or curved,up to to about 11 mm long, dart reddish brown to yellowish brown contrasting with the paler radial spines. Radial spines: Numerous (30 to 50), radiating, straight or often slightly curved backward, white to yellowish, 4-6 mm long. Flowers: Bell-shaped, to 16 mm long and in diameter. Tepals creamy-white or yellowish-green, with or without a pink-reddish to purple central band, but also pink or purplish. Stigmas green, short. Outer perianth segments lanceolate, to about 9 mm long, 1 mm wide, pointed or rounded at the top. Inner perianth segments about 5 mm long, 2 mm wide, whitish, yellowish, or pink glossy. Stamens numerous, filaments pure white, anthers pale yellow, all curved towards the centre. Style thin, white. Stigma lobes 5, about 1 mm long upright, pale green, protruding slightly over the stamens. Fruits: Pale green, or pale pink. 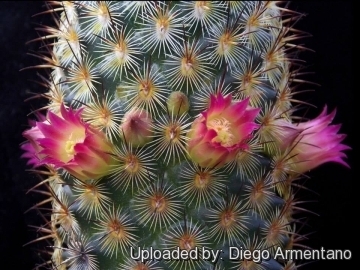 Mammillaria microhelia Werderm. : has a columnar stems. Flowers creamy-white, pink or purplish. Radial spines 30-50 white to yellowish. Centrals 1-4, sometimes absent, occasionally as many as 8(-11) dark reddish brown. Distribution: Queretaro, Mexico. Mammillaria microhelia var. microheliopsis (Werderm.) Backeb. : stems almost spherical, radial spines 30-40, central spines 6-8, flowers mostly pink or purplish. Distribution: unknown (originally described from cultivated plants). 5) Sánchez , E. & Guadalupe Martínez, J. 2013. 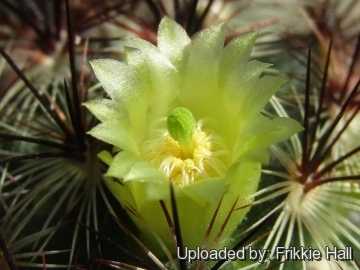 Mammillaria microhelia. The “IUCN Red List of Threatened Species.” Version 2014.2. <www.iucnredlist.org>. Downloaded on 26 July 2014. 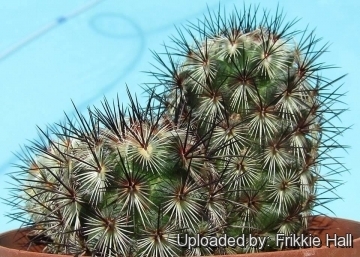 Cultivation and Propagation: In good conditions with careful application of water and excellent ventilation Mammillaria microhelia grows without difficulty. Growing rate: It is a slow growing species that rewards the patient grower with a beautiful displays of flowers since from an early age. 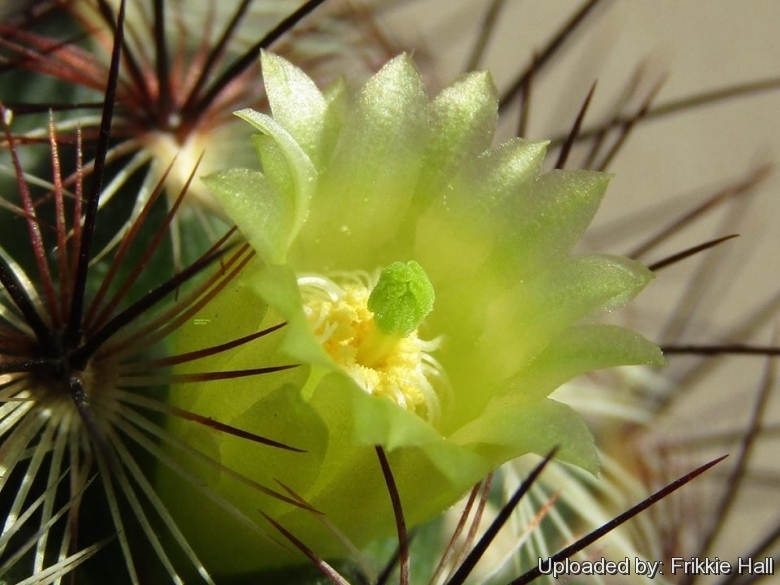 Soil: Requires good drainage provided by a very permeable open cactus soil (With not less than 50% grit content). Reduce the use of peat or other humus sources in the potting mixture.